Place chicken, canned tomatoes, Ranch mix and taco seasoning in a slow-cooker set to Low. Cover and cook for 4 to 8 hours, or until chicken is easily shredded with a fork. Shred meat and serve inside tortilla bowls. Top with lettuce, cheese, sour cream or any favorite taco toppings. Does it get any better than tacos? We think not. Everybody loves tacos but nobody loves it when they end up with more taco filling in their lap than on their plate. Consider the messy problem that can be tacos solved. 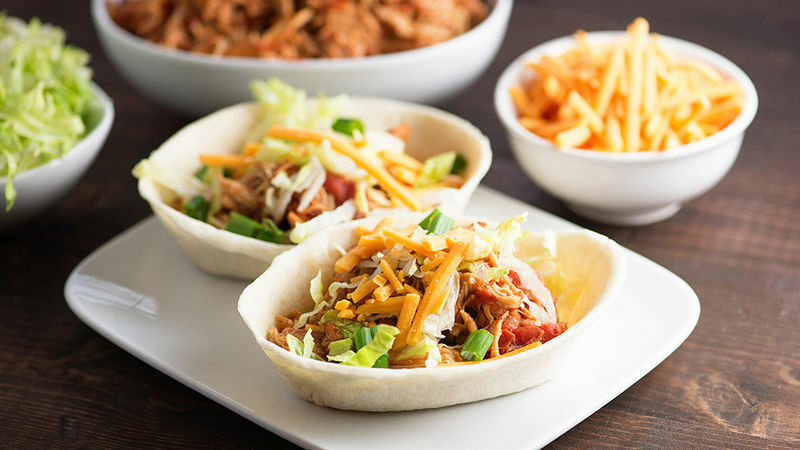 Not only are taco boats like little edible burrito bowls but they also just happen to be the perfect vessel for to hold all of your favorite taco fillings and toppings. Rest assured with Old El Paso™ taco boats™, every bite of double-seasoned rotisserie chicken makes it right where it belongs—on your fork and in your mouth. With only five ingredients, this recipe doesn’t miss a thing and neither will you.